The weather is warming up after our first chill of the year. It got down to freezing three days in a row. BBRRR. There’s another Shuttle launch coming up in about two weeks. Only a few more launches left. End of an era. Got a humorous email from Don Shepperd about visiting his mother in her nursing home last Veterans Day. 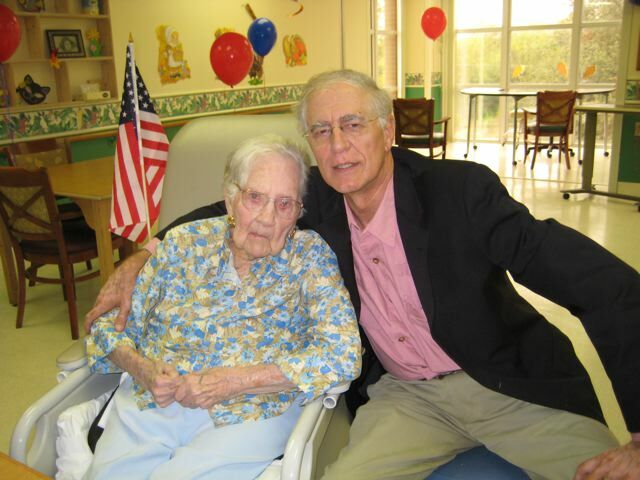 He says: "Jenks, my mother who is homing-in on 99 (April 20th), looked patriotic on Veterans Day – American flag adorning her reclining chair, red, white and blue balloons to fest-up the dining room surroundings of her San Antonio nursing home. She saw me right away and waved – eyesight still good with glasses and she still remembers my face. So far, so good, although I fear a big change every visit. Excuse me , Sir," the care-giver supervisor motioned me over. "I need a minute with you." I gave my mother a 1-minute signal and she nodded. "Sir, your mother hit a lady this morning…and…and…and this is not the first time, Sir." "Uh, OK. This is not my line of work. What would you like me to do?" "Well, Sir, we would like you to talk to her." "OOOOOOOOOOOOOK. This should go real well." I went to my mother’s room, rustled through her drawers, retrieved the portable headphones and microphone I use during visits for audio amplification and returned to the dining room. I sat down on a stool, placed the phones over her ears, turned the volume up loud, REAL LOUD, a 10 on the Richter scale, and put on my sternest face. "MOTHER! YOU MUST STOP HITTING PEOPLE OR THEY ARE GOING TO THROW YOU OUT AND YOU ARE GOING TO HAVE TO MOVE IN WITH ROSE AND ME!" (her worst nightmare). Essentially deaf, she winced from the volume and I turned it down. "Well," Mother began…, "she tired to take my milkshake and if she does it again, I’ll hit her again." I reported back to the supervisor. "I just had a long, serious talk with my mother. She is deeply sorry. She apologizes and will never do it again." The supervisor looked dubious. "If she does, DRUG HER!" I offered and hurried back to Mother’s Room. The rest of the story was hilarious but I don’t have room for it. Thanks Don. After my last column Colin Richardson sent me an email that tells how he was drawn to USAFA. To wit," Jack, your latest checkpoints is great! You really should have told them, though, that the young lady was indicating MOI! The part about Lowry brought back a memory I don't think I've passed on. In 1955, I was sent to Lowry for electronics school. My barracks was directly across from the then Academy, and we used to sit on the back steps and watch what we could see of the goings-on. It was at that time I decided to try for the Academy. In 1956, I was an alternate, according to the letter I received from a Massachusetts Congressman whose name I can't recall. In 1957, I was first alternate. So the letter said. Also, in 1957, I was selected to attend the Naval Academy Preparatory School at Bainbridge, MD. I recall that AFA was taking a small number from the enlisted ranks, and I didn't make the first cut. However, one had to be medically able to fly at the time, and after the physicals, I slipped in. It started at Lowry when I saw the Class of 1959 beginning their journey. Coli" Thanks for the history. Good story. I got an email from Paul Landers. It sounds like he is doing well. Here are his words. "Jo Anne and I are doing well. We continue to enjoy our retirement, which we mostly spend with family and friends, play golf, and travel. We were in Spain and Portugal for three weeks this fall, with an afternoon in Gibraltar and a day trip to Tangier. We attended the AFA-TCU football game last month…not a great outcome, but the day and the tailgating were fine. I watched the game with Jerry Smith and Rick Wheeler. Attached is a photo; since we are smiling , it obviously was taken before kickoff. Jerry continues to work, says his life is probably dull compared to bachelor Rick in the day of Viagra. Rick counters that his life in Austin is ‘staid’: working, seeing his steady date and taking care of his 92-year-old mother who lives with him. I think we are all very lucky to have good health and good friends and family. Jo Anne and I wish you a Merry Christmas and a wonderful new year. Paul Landers." I saw in the last Checkpoints that "Lefty" Adams had passed away at press time: Lt Col (Ret) Wendell M Adams, Class of 1962 died on Sept 26, 2008, in Springdale, Ark. That was the first I knew about it. Will someone please pass along the information to me for the next issue. Lots of traveling by our classmates. Here’s what I know so far. Willie and Nancy Gray got to China after a cruise around Italy. TK Moore and Virginia went on a safari in Africa, to Williamsburg, to Paris and Halifax. Deke and Judy Dinsmore opted out of traveling to spend much time with six grandchildren. Charlie and Mary Jo Price gave time and effort for a mission trip Venezuela. They also went to several great golf courses, visited family in Orlando and other places. Gail and Carol Peck visited family and friends around the US, had a new house built and toured England and Italy. Charlie and Pat Hale are doing well. Charlie finally retired for good. He likes sleeping late. 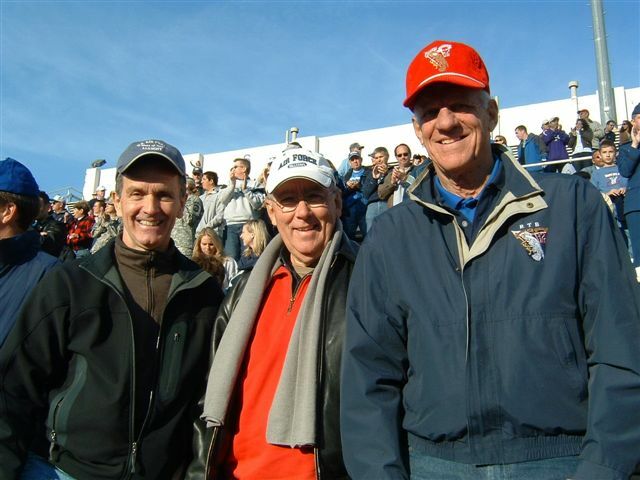 They had a military unit reunion in Washington, DC and they saw the AFA – San Diego State game. Larry and Penny Gooch did some traveling to Hampton, VA, Kitty Hawk, Austin, Branson, Baltic cruise, Colorado and Kansas. They should have finished a cruise around Cape Horn by the time you read this. Got a picture of the Bill and Sue Haugen Family on the beach. Good idea. No coat and tie required. They went on a WW2 D-Day Invasion tour- London, France, Berlin, etc. Bill also got to the Oshkosh Fly-in. Art and Sandy Farrington had their 13th grandchild this year. They also had a great-grandchild more than a year ago. They have been all over the US and look forward to more adventures, "having failed retirement" as they say. That’s it for now. Have a great 2009. God bless.